Slot Games listed are X Factor Slot and Zeus III Slot. X Factor is based on the popular British TV Game Show. It has 3 bonus games - The Boot Camp Bonus, Judge Bonus and Live Final Bonus Round. 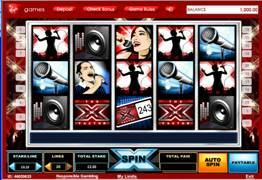 The X Factor Slot is a Nextgen software slot with 5 coins and 20 paylines. Minimum bet is 1c.